Dispersal is a fact of wolf life; wolves naturally leave their birth packs, seeking a mate, open territory, or both. Oregon's OR-7 catapulted to stardom when the international media glommed on to his dispersal. Then there was that lone wolf spotted on the North Rim of Arizona's Grand Canyon. But a wolf traveling to a state where it is not federally protected from hunting, trapping, or poaching unknowingly faces deadly risk. OR-7's sister left Oregon and was killed by an Idaho trapper. OR-9 and OR-16 also died in Idaho - from gunshots. OR-18 ran that Idaho gauntlet only to walk into the gunsights of a Montana poacher. The Grand Canyon wolf was killed by a hunter. 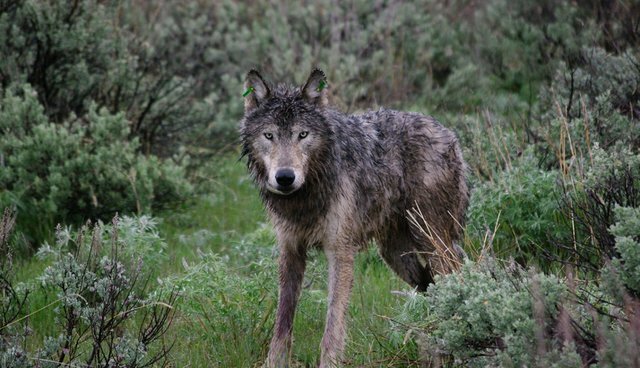 Killing of dispersers happens frequently around the US, according to a report, "Making Room for Wolf Recovery," by the Center for Biological Diversity (CBD). The report makes the case that dead dispersers confirm the need for continued federal protection under the Endangered Species Act. The passage of the 1973 ESA enabled wolves - one by one and year by year - to reclaim a smidgen of the territory we had stolen from them with guns, traps, poison, and fire. Just 13 years before the ESA protected them, the only wolf country left in the lower 48 was Minnesota with no more than 500 survivors. But with federal protection wolves dispersed eastward to northern Wisconsin. Then Wisconsin wolves drifted further east to Michigan's Upper Peninsula, mingling there with wolves from Minnesota and Ontario. Twenty-five years after the ESA, descendants of wolves reintroduced into Yellowstone and Idaho began dispersing into Montana, as did others from Canada. Some of Idaho's wolves swam the Snake River and adopted Oregon. British Columbia wolves slipped across the border into Washington. The CBD report documents 58 instances over 30 years where wolves dispersed from recovery areas to new states. The report also analyzed 27 research papers that found plenty of unused habitat suitable for dispersers. In fact, the current population of wolves in the lower 48 "could be nearly doubled if federal protections were retained and recovery efforts began to restore wolves to some of the places they once called home." California Even if wolves filled these new areas and doubled their total population, they would still occupy only a shadow of their original habitat: as many as two million wolves roamed North America when colonists arrived. Wolves are by no means out of danger of being endangered. Wolves are driven to disperse. Unfortunately, some states are just as driven to kill wolves. It's up to the Obama administration to believe the science, doubt the anti-wolf lobby, and do the right thing: continue federal protection under the Endangered Species Act.